How do I download file attachments for my course or live training? You can download and view files attached to any course or live training you are enrolled in. Note: Viewing attachments within Bridge is currently not supported. 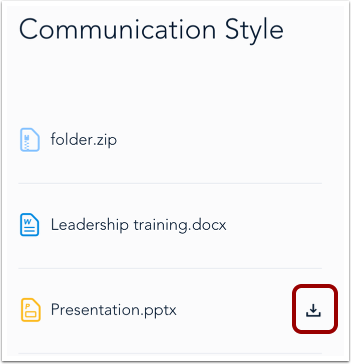 On the My Learning page, a course with attachments displays an attachment icon with the number of attachments included with the course. To open attachments, locate a course and click the Attachment icon. The attachments tray  will open on the right side of your browser window. In the attachment tray, you can view the attached files . To close the attachment tray, click the Close icon . To download a file to your computer, hover your mouse over the file and click the Download icon. Note: Viewing course attachments within Bridge is currently not supported. Previous Topic:How do I edit my comment in a course? Next Topic:How do I view a certificate of completion for my course? Table of Contents > Learners > How do I download file attachments for my course or live training? How do I add a file attachment to a course or live training?